Harry’s Tottenham has a lot to like about it. Modric, with his geometrically perfect passing and Bale, with runs that make defenders turn into office chairs are the jewels in the crown. Van Der Vaat (his wife is awesome on Twitter) though, is my favourite, all running, giving everything for the cause – he just looks like he loves Tottenham and would do anything for us. There’s old pros (King, Friedal, erm Nelsen), young kids (Walker etc) and about 37 quality midfielders to choose from. At one stage, we were playing sublime football, all wingers, full backs, overlapping runs, tasty balls through the middle (ooo-er) and goals going in all over the place. We were also genuinely challenging for the league. Or so we told ourselves. And anyway – the beauty of being in the top three for the first three quarters of the season was that surely, surely, if we messed up, at least we could fall back on Champions League qualification for next year. Um, this is Tottenham, haven’t you been paying attention? The two Big Distractions came mid season. First came the ‘is Harry Redknapp a dodgy geezer?’ court case, to apparently no effect. The players rallied around and continued winning. But then, on the day Harry was found not guilty, Fabio Capello flounced out (if you can flounce out in a car) of the England job. All of a sudden the newly-not-dodgy ‘Arry was the popular choice for England. And Spurs began crapping themselves. The slide was painful. Whenever Tottenham start doing well, I’m bracing myself for the inevitable failure. THIS SEASON, for the FIRST TIME, I’d finally come to terms with us being a Proper Team, a team that wouldn’t just inexplicably fold in a Tottenham-like matter when it really counted. But slide we did. Second. Third. Fourth. FIFTH. Jesus wept. Somehow, we kind of turned it around toward the end, and clung on to fourth. If it wasn’t for WBA’s second choice keeper throwing the ball into the net three times against Arsenal, we would have wrapped up third and a definite champions league spot on the last day, but we should have wrapped up third (at least) months ago. We only had ourselves to blame. And so, our fate was in Chelsea’s hands. The veterans Terry, Lampard, Drogba, all tackles, dirty tackles, painful OTT goal celebrations, referee abuse and loathsomeness beyond reasonable levels had one last chance to get that European trophy their owner has been so desperate to buy. But against Bayern? In Munich? Surely they’d have no chance. I worked myself into an epic frenzy on the Twitter but sadly, it had no effect on the outcome. Chelsea, with their football-free style took it, in the most painful fashion you can imagine if their success was the difference between your team making the Champions League next year. It was awful. And so, we’re out of (proper) Europe, and I expect it’ll be a very long off season. Some Spurs fans have turned on Harry after his flirtation with England. Modric and Bale will no doubt be linked with every top Italian or Spanish club, and may well go. I don’t have a clever way to finish this, it’s been a harrowing, frankly. As Ali G said, there is a high, but there is also a low. I’d love to be optimistic that we’ll build on what we have now, but you know, this is Tottenham. Let’s see who’s still there next season. Happiest I have been is when. ‘appy ‘arry didn’t get the England job…like spurs dislike media darlin’ Harry! Not sure how they will go when modric, bale and pienaar leave this summer! @Dave – that is tough mate, real tough. Yeah, I realise (and say) that we should have wrapped it up ages ago. This is just such a *Tottenham* way of being shafted, Chelsea are getting the full force of my venting. 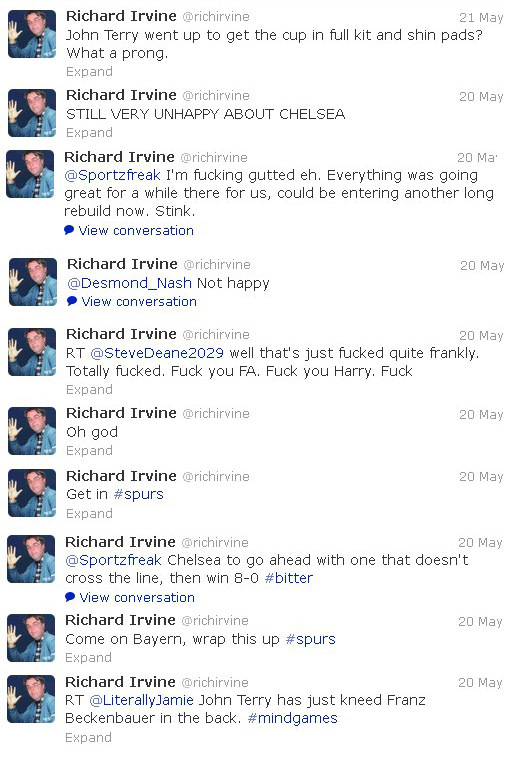 Rich, you could support Liverpool and then life would be truly dire. At least you had pretty football to watch.